Monte Cirotto Service Details - Guelph, Ontario | Gilbert MacIntyre & Son Funeral Home and Chapel Ltd.
CIROTTO, Monte - At Hospice Wellington, Guelph on Wednesday November 28, 2018. 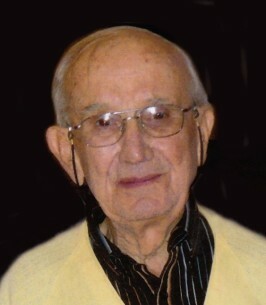 Monte Cirotto, age 91, beloved husband of Kathleen (Kay) (née Bresson) Cirotto. Survived by his son Michael, and 2 daughters, Kathryn and Debra. Loved Gramps of Michael Pirie, Julie Pirie Whitby (Brett), Josyf Mudryj, and Adriana Mudryj, and precious poppa of Blake and Shane Whitby. Dear brother of the late Alex (late Phyllis). Survived also by numerous friends and relatives in Cape Breton. Dear uncle of Ron (Hilda) Cirotto and family. A Funeral Mass will be held at St. John’s Church, 45 Victoria Rd. N., Guelph, on Tuesday, December 11, 2018, at 11 a.m. Interment of ashes at Our Lady Immaculate Mausoleum, Marymount Cemetery at a later date. As expressions of sympathy, donations to Hospice Wellington would be appreciated by the family. Cards available at Gilbert MacIntyre and Son Funeral Home, Dublin Chapel, 252 Dublin St. N., Guelph, 519-822-4731 or online at www.gilbertmacintyreandson.com. We encourage you to share any memorable photos or stories about Monte. All tributes placed on and purchased through this memorial website will remain on in perpetuity for future generations. Dearest Kay and Family: Sorry to hear of Monte,s passing. Our Deepest Sympathy. He will be missed as a Friend, and in Real Estate circles and in the Skiing community! Yours Marg & Joe Peter. Note Donation made to Hospice Wellington, in Monte's name.